The Washington Redskins, champions of the NFL in 1982, began their title defense with a Monday night game on September 5, 1983 against their arch-rivals, the Dallas Cowboys. It was a humid 87 degree night in Washington, but it did not dampen the enthusiasm of the sellout crowd of 55,045 at RFK Stadium. Washington, coached by Joe Gibbs, featured the passing of QB Joe Theismann and the ground-gaining of rugged RB John Riggins on offense, along with an outstanding line known as “The Hogs” and a capable group of receivers led by WR Art Monk. The defense lacked big names but played well as a unit. As for Head Coach Tom Landry’s Cowboys, they had most recently lost to the Redskins in the NFC Championship game – their third straight trip to the conference title contest that ended in defeat. QB Danny White was capable but also living in the shadow of his illustrious predecessor, Roger Staubach, and RB Tony Dorsett, TE Doug Cosbie, and wide receivers Tony Hill (pictured above) and Drew Pearson were all solid offensive performers. The defense had slipped in ’82, however, showing signs of age. The Redskins were emotionally high coming into the opening game and did well at exploiting weaknesses in the Dallas defense during the first half. The Cowboys started their first drive from their own 16 yard line and that was typical during the first two quarters of play as they were consistently kept on their own half of the field. In the first quarter, Mark Moseley started the scoring off with a 23-yard field goal and Riggins scored a touchdown on a one-yard carry. 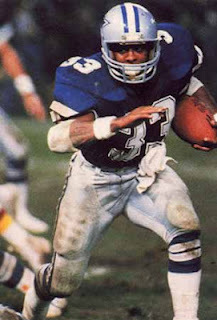 The biggest first half highlight for Dallas came in the second quarter on a 77-yard run by Tony Dorsett, who was caught from behind by fleet CB Darrell Green. Stifled again by Washington’s defense, the Cowboys had to settle for a 26-yard Rafael Septien field goal. Moseley followed up with field goals of 30 and 39 yards and, with 40 seconds left in the first half, WR Charlie Brown made an outstanding catch of a Theismann pass for a 41-yard touchdown that seemingly put the Redskins in command at 23-3. The Cowboys made adjustments to the defense at halftime that successfully countered Washington’s attack during the second half. Things began to turn around early in the third quarter when White completed a pass to Tony Hill, who raced past CB Vernon Dean for a 75-yard touchdown. Shortly thereafter, White hit Hill again for another long scoring play, this time victimizing the inexperienced CB Anthony Washington in the secondary. Suddenly, the Washington lead was down to 23-17. Still ahead by six points, the Redskins drove to the Dallas 14 yard line but were moved back by a holding penalty and then Moseley had a critical missed field goal attempt from 31 yards. Dallas responded by driving 80 yards – 27 coming on runs by Dorsett and aided by a late hit of White called on LB Mel Kaufman - and taking the lead with White running around end for a short TD, followed by Septien’s extra point. The Redskins finally scored again in the waning seconds to close to one point, but it was inconsequential to the outcome once a desperation onsides kick was recovered by the Cowboys. Dallas came away with a 31-30 win. Washington outgained the Cowboys (447 yards to 356) and had more first downs (26 to 16), but was also penalized seven times, to just two flags thrown on Dallas. Moreover, the inability to put more points on the board in the second half until it was too late, combined with the big plays by the Cowboys that exploited weaknesses in Washington’s defense, made the difference. For the Redskins, Joe Theismann was successful on 28 of 38 throws for 325 yards with two TDs and the one late interception. Alvin Garrett caught 10 of those passes for 101 yards and Charlie Brown added 6 for 97 yards. John Riggins ran the ball 27 times for 89 yards and a touchdown. The opening defeat was easily overcome by the Redskins, who won the rematch in Dallas later in the season and lost only one other game in compiling a 14-2 record. Featuring their high-scoring offense, they again advanced to the Super Bowl, only to be upset by the Los Angeles Raiders. The Cowboys finished second in the NFC East but qualified for the playoffs as a Wild Card with a 12-4 tally. They didn’t make it to the NFC Championship game this time, falling to the Rams in the first round. 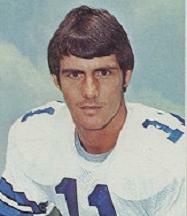 Danny White (pictured at right) placed third in the league with 3980 passing yards and tied with Joe Theismann for second with 29 TD passes. 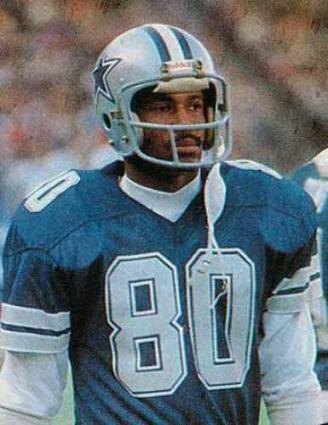 Tony Hill caught 49 passes for a team-leading 801 yards (16.3 avg.) and 7 touchdowns. Doug Cosbie was selected to the Pro Bowl for the first of three straight yeas as he pulled in 46 receptions for 588 yards and 6 TDs. Also chosen for the Pro Bowl was Tony Dorsett, for the fourth time, who rushed for 1321 yards on 289 yards (4.6 avg.) and caught 40 passes for 287 more yards and a total of 9 touchdowns.